Archie is deloused and transitioned in the Leopold and Loeb juvenile detention center. The warden tells Archie is he stays in order, he will let Archie use the music room. Veronica plans to keep spirits alive at Riverdale High in honor of Archie. The doctors think stress caused Betty's seizure. They think Betty's hallucination was caused by the seizure. Dilton died from the Gargoyle King ritual; Ben is on life-support. Archie shows his tattoo to the Serpents in juvie to join their gang. Joaquin is there and calls his bluff; he wants Archie to shive a Ghoulie to get their protection. He declines their offer. Betty and Jughead visit the new mortician to view Dilton's body; they bribe him. Dilton's toxicology report shows high levels of cyanide. There are three symbols on his back. The mortician thinks the true face of evil caused the murder. Jughead develops his photos of the marking in the school photo lab. Archie practices guitar in the music room, but a bunch of guys surround him. The guys are Ghoulies who were arrested because he called the cops on them during the drag race. They beat him up and steal his soes; they don't hit his face. Veronica visits him and she's suspicious of his behavior. Veronica took over student council responsibilities for Archie. Betty discovers Ben is out of the ICU. Evenlyn Evernever tells Betty she won't tell anyone about her seizure. Kevin tries kissing Moose in the halls, but he pushes him away. He's afraid of his dad finding out about his sexuality. Cheryl gives Veronica a bit of hell at the Chock'lit Shoppe and leaves. Sheriff Maneda wants Betty and Jughead to stay out of the investigation. One of Dilton's adventure scouts is missing; his parents call in a missing report. Veronica wants to start a chapter of the Innocence Project to help Archie. She asks Hermione to her start the project as the mayor. Jughead and Betty show Ethel the hanging man ornament she left in Ben's hospital room. Ethel made the talisman to protect him from the Gargoyle King. Ben was her boyfriend; they spent all their time together at Dilton's bunker in the woods. She plans to show them the bunker. Archie is in pain after the beat-up. His cellmate tells Archie that he needs to be an animal to protect himself before they kill him like one. FP and Alice chastise Betty and Jughead for snooping in Ben's hospital room. Archie's buff cellmate helps break up a fight between the Serpents and Ghoulies. Archie convinces everyone to play a game of football. Alice is worried about Betty's health. Betty sneaks out of her room to head into the woods; she tells Jughead about the seizure. They get freaked out by the bloody Gargoyle figure slowly walking toward them. Jughead and Betty rule Ethel out as a suspect. They check Dilton's make to locate the secret bunker. Veronica agrees to Cheryl's bid for student council president, but she needs Cheryl and the Vixens' help. Moose hangs with the RROTC at the Chock'lit Shoppe, but he brushes off Kevin. Kevin feels like Moose is ashamed of him. Mad Dog warns Archie to not let the prison or Warden take his life away from him. Mad Dog is destined for 20 years of real prison after juvie. 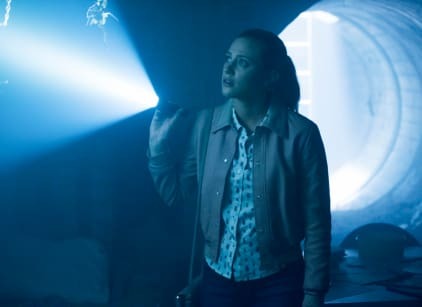 Betty and Jughead discover the bunker; they find Dilton's missing scout in the bunker. Ethel was only dating Ben in the game; she warned him that two people might be dropping by. Veronica, Cheryl, Josie, and the River Vixens cheer on the guys at juvie. They sing "Jailhouse Rock" for the football game. Hiram shows up at the juvie; he tells her that he has the warden in his pocket. He's going to make sure Archie won't be getting any visitors in the future. The warden sends the guards into the crowd to stop the "riots." People are getting attacked in the field; Archie is subdued with batons. A guard tells Archie that Mad Dog died in the riot, which couldn't be possible since he wasn't at the game. Hiram forced Veronica's name on a "do not admit" list at the juvie. Cheryl is going to get Veronica fake ID. Jughead and Betty confront Ethel about her lies; she's afraid about talking to anyone. Ethel starts having a seizure. Kevin joins the RROTC to be with Moose. The warden visits Archie and tells him that he's been tapped. He will be the new "Mad Dog." Hermione invites FP, Hiram, Sheriff Keller, Alice, Fred, Penelope, and Sierra McCoy to their office to warn them about a problem. Ben and Dilton's problem about blue lips happened to them in the past. They're afraid. Ethel survived the seizure. Betty and Jughead visit Ben, but he committs suicide to be with Dilton so he can ascend. Betty: Juniper and Dagwood, are they alright? Alice: Okay, here we go again. Polly: Juniper and Dagwood are napping. They’re fine. Why wouldn’t they be? Betty: Ummm, because I saw you and Mom throw the twins into a giant bonefire last night. Alice: Okay, that’s enough! The only thing burning last night was the hibachi in the backyard. We were making skewers with a few friends. Alice: Yeah, as a matter of fact. Polly: You must’ve had a hallucination from the seizure. Betty: It was so real. Permalink: You must’ve had a hallucination from the seizure. Betty: What caused the blue lips? Doctor: The cyanide was mixed into a sugary drink called, “Freshade.” Blueberry flavored. There’s something dimly familiar about this. If you had asked me before if I thought this was murder or suicide, I’m not sure what it is. But, whatever it is, it is darker than what happened to Jason Blossom or with The Black Hood. No, what we’re looking at here, I believe, is the true face of evil. Permalink: What we’re looking at here, I believe, is the true face of evil.